Happy Mushroom Slots|Moon Games| Play now! There’s a fungus among us! 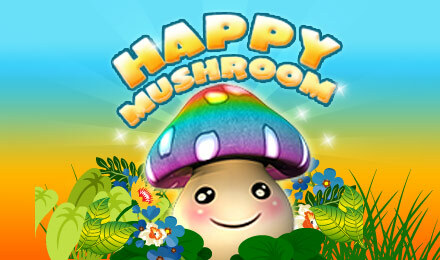 It's Happy Mushroom Slots, a 5-reel 25-payline garden-themed slot game sprouting up bonus spins! Happy Mushrooms Slots is a quirky video slot machine with animal character symbols and a cute, cartoon theme. It has five reels and 25 pay lines, with customisable betting options to tailor your bets to your budget. Spinning three or more owls across the reels will activate the free spins feature. All prizes are doubled during the free round and it can be retriggered. The Mushroom Adventure bonus is triggered by three or more Mushroom Scatters across the reels and this is a fully interactive bonus round where you could win even more coin prizes. The final special symbol is the flower which is your Wild and can be substituted onto any payline which doesn’t feature any other special symbol. Happy Mushroom Slots offers a range of bonus features which make it an attractive gaming option. It has a cute animal theme and there is the chance to win a share of some big jackpot prizes.